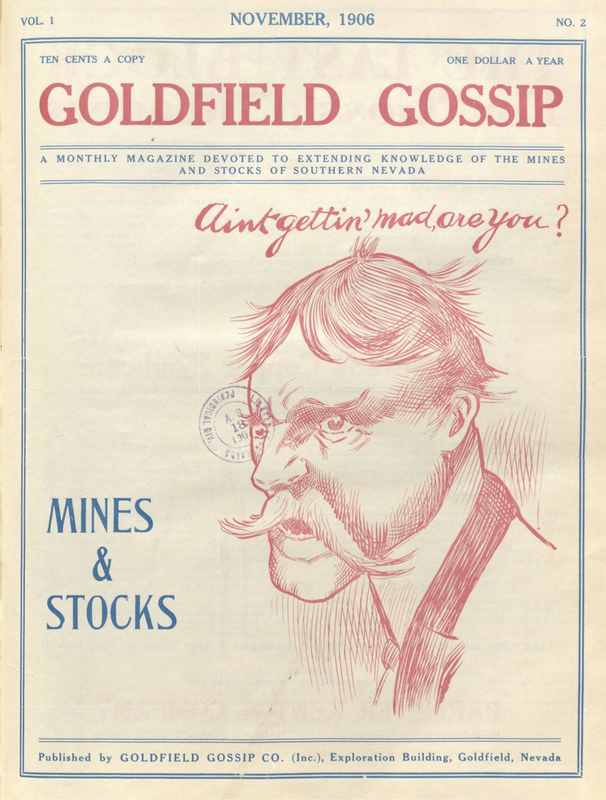 A Monthly Magazine Devoted to Extending Knowledge of the Mines and Stocks of Southern Nevada. Goldfield/Carson City, NV. Editor: Sydney Blanshard Flower, a.k.a. Parmeter Kent. 1/1, October 1906-January 1908. 30 ppl, $1.00 a year. This journal is included here because of its editor/publisher. The association of Flower/Parmeter with it alerts us to the fact that there was necessarily something suspect about the journal. Flower by the time this journal appeared had put out a string of New Thought journals, notably The New Thought, in Chicago, which had been connected with financial disasters and claims of fraud. This journal purported to be a summary of local gold-mining opinion in southern Nevada, but it was primarily intended as a promotion of "Parmeter Kent's"(the editor's) mining-stock brokerage and was distributed mainly in the East where copper miners were few and far between but investors and dupes abounded. The scheme came tumbling down when, probably under threat of the revelation of his past, Kent revealed that he was really Sydney Blanshard Flower and that, although he was now reformed, he had previously been charged with mail fraud for a variety of schemes involving, notably, a magnetic ore separator and a Colorado gold mine, which he had promoted through The New Thought. This implausible story of reform had the desired effect and the journal continued until the beginning of 1908 when the fever of mining speculation cooled--and the Post Office again brought mail-fraud charges against Flower. His next journal, The Yogi, was begun while he was in jail pending trial. He was tried twice on the fraud charges, with a hung jury the first time and an acquittal the second. LOC.